A 29-YEAR-OLD man from Bulawayo has appeared in court for escaping from Bulawayo Central Police Station. 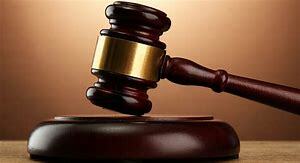 Lewis Moyo (28) from North End suburb pleaded guilty to an escaping from lawful custody charge when he appeared before Bulawayo magistrate Mr Franklin Mkhwananzi. He was remanded to today for sentence. Moyo was arrested on April 5 this year at around 12.50PM at Private Lounge, Corner 3rd Avenue and Fife Street, Bulawayo. Prosecuting, Mr Nkathazo Dlodlo said Moyo pointed a pellet gun at a stranger’s chest and threatened to shoot him. “The stranger screamed for help and was assisted by two security guards to arrest Moyo,” said Mr Dlodlo.